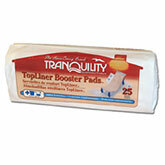 You are buying the Tranquility TopLiner Booster Pad 14"x4" 2070CA 1/Case, manufactured by Tranquility Incontinence Products. Tranquility is a leading manufacturer of incontinence products like briefs, underwear, liners, pads, and more. At ADW Diabetes, we offer a large selection of Tranquility products in both single package and case pack quantities to best fit your needs. TopLiner Booster Pads are designed as flow-through pads that fill to capacity then pass additional fluid to the primary undergarment - economically extending the use of any disposable brief or undergarment. They improve wearing comfort by ending leakage, rashes, and nighttime changes. Easy to change and dispose. Latex-free. The Super Booster Pad is longer and more absorbent to contain full void episodes. The Mini Booster Pad is designed for use with personal care pads and youth sizes. All Booster Pads have an adhesive strip so that they can be secured on the target area where extra absorbency is needed.